Working closely with our farmer we are proud to present our new ‘healthy range’ of ham. 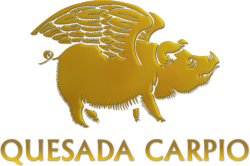 Gran Reserva Gold is the brand new name for this range whereby we have introduced new feeds to the pigs such as the chestnut and beer yeast. We hope you like our new look website. You can now browse our full catalogue of ham, cheese and olive oil, as well as our new range of healthy ham – Gran Reserva Gold.